Flooding occurs quickly and often unexpectedly, leaving you little time to act. 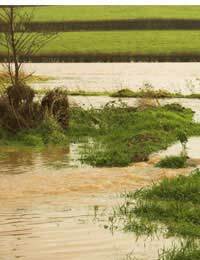 Creating an emergency flood plan will prepare you for the worst and help you avert any disaster. Flood emergencies give you little time to take action and prepare your family and your home. However, if an emergency flood plan has been carefully prepared in advance, everyone in the house will know what to do when the warning sounds and how to quickly prime the property for imminent attack. A torch with a spare set of batteries. A radio – either wind-up or one with a spare set of batteries. This is essential both to keep track of news reports and for morale-boosting entertainment. Warm and waterproof clothing, plus blankets. First aid kit, plus any appropriate health medication. All insurance documents sealed in a waterproof plastic bag. The flood kit should be easily accessible but not stored in the ground floor part of the property, as this is a high flood risk area. If there is no upstairs for it to be stored then it should instead be kept in a high place. If young children are part of your family unit then you should prepare a flood kit especially for them. Make a list of all the essential items you will need in order to keep your youngster contented. This could include milk, nappies, baby food, sterilized bottles and spoons, extra clothing and even a favourite teddy or toy. A flood emergency is not the time to learn how to turn off your home’s gas, water and electricity. You should already know how to do it with ease when the countdown begins. As a test, can you do it in the dark? If you are unsure then ask the suppliers of the services how it is done and, if necessary, mark taps and switches with explanatory stickers to help you remember. The whole family should be involved with preparing the emergency plan. When the weather turns, and the flood waters roll in, it’s no use one person knowing what to do because that one person might not be at home. Also, during the panic of any emergency, family members may be separated. It is therefore imperative to agree how everyone will keep in contact with one another. In addition to this, decide on an emergency contact, such as a friend of relative, who can be kept informed of the status of each member of family and whose home could be used as a refuge. If the property needs to be evacuated then decide whether everyone head there or is there an evacuation centre nearby? Remember to keep a list of emergency contacts as part of your flood kit. What Can Be Moved to Safety Now? Besides a cellar, the part of the property that is at greatest risk from flood damage is the ground floor. Therefore the emergency plan procedure also involves assessing what valuables and sentimental belongings are currently in this high risk area, and whether they can be moved up to a higher floor, or at least a higher part of the room. What Things Will Need to Be Moved on the Day? Of course, in order to carry on living a normal life, not everything can be moved upstairs in advance. So consider what ‘living’ items you would want to move when the flood strikes. Do you have a house pet that would need to be moved to safety? Would you be prepared to move furniture or electrical goods?